By spending a few hours looking out your income and outgoings it is possible to not only possible to live within your means but to save money as well. For anyone wishing to downsize their lifestyle control of their budget is a must! Take a look at the salaries and other earning potential of every person living in your property who will be part of the downsizing project. If they pay tax are they paying the correct amount? A call to the tax office can answer any worries that you have on this subject and possibly save money. For those that are self employed check that you are claiming back all business expenses when calculating your yearly tax return. Unlike people who are employed and have their tax deducted each month a self employed person’s tax is calculated and billed at the end of the tax year, they also have to pay part of the following years tax as well. 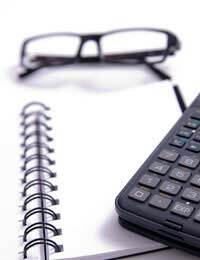 By putting 20% of the value of each invoice into a high interest account as it is paid not only will you have not spent the money for your tax but you will find that by the end of the year it will have earned interest and you may well have saved more than what will be due to the tax man. Take a few hours to sit and list every outgoing from the family bank account each month. Don’t forget those small yearly club memberships or charity donations – they all add up. No doubt you will be horrified by what is spent and it is now, before you downsize your life that you must look to these outgoings and try to chip away at them and save some money. Don’t hide your head in the sand and carry on spending without a thought to your bank account balance, this will make it harder to downsize and you will have to continue working all hours to feed money into the bottomless pit that is the family budget. Set a weekly budget for the family food bill and stick to it. If the money runs out by Friday do not dip into savings but go to the cupboard and check what is lurking at the back of the shelves. There will be plenty of tins and jars that will yield more than enough food to sustain a hungry family. Plan the week’s meals and do one shop for the bulk. Allow enough cash to cover perishables such as fruit, vegetables, bread and milk. Hopefully you would have paid off your mortgage before downsizing but quite often these days it is not possible. Obtain advice from an independent financial advisor to see if you can switch mortgages and lower your monthly outgoings. A mortgage is still a debt and we all want to live debt free. By paying off slightly more than the minimum sum each month you will shorten the term of the mortgage and bring that large debt to an end much sooner than planned. You may rent the home that you live in and in some ways this is dead money as you are paying for something that will never belong to you. Yes, we all have to have a roof over our heads but could you possibly move to something a little cheaper? Better still is there a chance you could purchase the property? The house would soon become a valuable asset and as a sitting tenant you may be able to barter for a substantial discount on the current value of the property. As the seasons change we all purchase more clothing. Rather than go down this route take a day to empty your cupboards and wardrobes and sort through every item of clothing. If something no longer fits or is out of fashion either sell it through an online auction web site, at a boot sale or give it to a charity shop. You will find clothes you forgot you had, probably enough clothing to see you through the next year. Check that you are not paying above the odds on utility bills. Sometimes by swapping utility companies you can make considerable savings on your quarterly outgoings. Something that many people forget to do is to cancel insurance policies that are no longer needed. You would be surprised how many people still pay out for mortgage protection insurance long after the mortgage has been paid off. Household and car insurance should be looked into each year rather than just renewing there are bargains to be had for the canny shopper. We all like to have a few pounds in our pocket but if these coins are not spent wisely they will make a severe dent in the household budget. If you spend money each day on lunch why not make your own? Cans of fizzy drinks and packets of crisps are far cheaper bought in bulk and carried with your lunch each day than purchased singly. A lunch that can easily cost five pound each day can be reduced by over half leaving you with cash for special treats or a trip to the pub at the end of a hard week’s work.